JC and Ulrich Bez, plus a dazzling yellow V8 Vantage - Geneva Salon 2005. A very happy test driver in 2007. I’m fortunate to enjoy a long and enduring friendship with Ing. Dr. Ulrich Bez, whom I had known for some years, prior to us both working for Daewoo Motor, between 1994 and 1998. 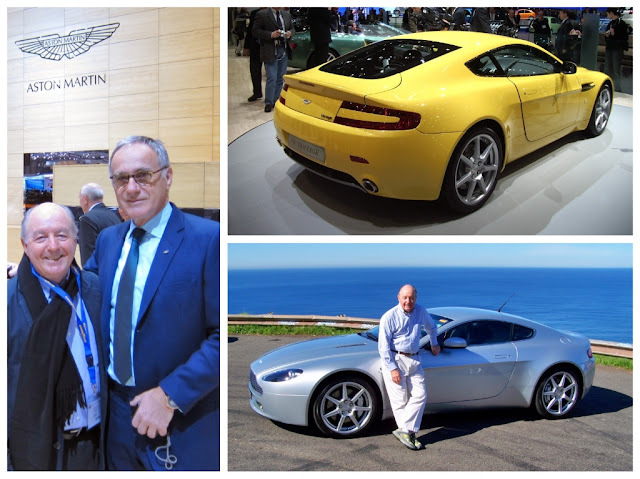 In July 2000, following due diligence duties for the owner of Aston Martin, Ford Motor, Ulrich put together a consortium of financiers, which acquired Aston Martin from Ford. Ulrich Bez then became Chairman and Chief Operating Officer of Aston Martin Lagonda, stepping down in 2013, to become non-executive chairman. One of the first new models he was keen to develop was a smaller two-seat coupe with an optimum power-to-weight ratio with which Aston Martin could challenge the dominance of the Porsche 911. He first revealed the plans to me in 2004, and the car debuted at the Geneva Salon in 2005. The design was by Henrik Fisker, but Dr. Bez led the technical development of the car using the basic V8 block of the Jaguar AJ8 engine; however, all the ancillary components were developed solely by Aston Martin. The car was an immediate success with Aston Martin enthusiasts, but failed to make a dent in the Porsche 911’s dominance of the sector. 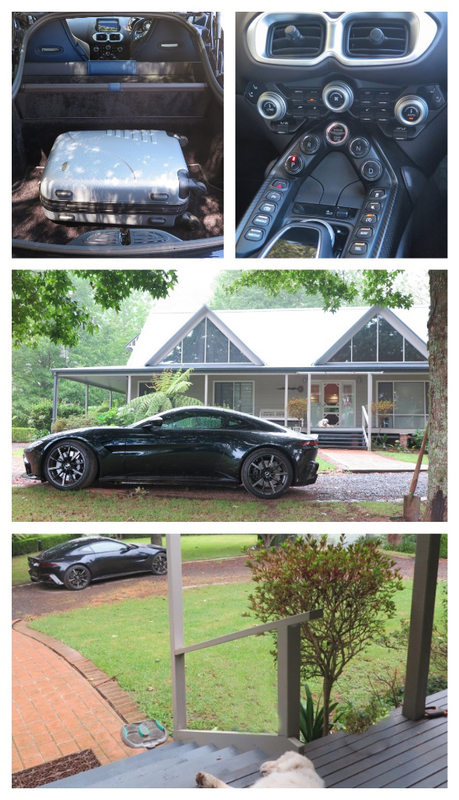 I was first able to drive the V8 Vantage in Australia in 2007, and was immediately impressed with its smoothness, ride and handling, and the performance. It was probably best described as a very ‘pretty’ coupe, with cohesive lines, which lacked any aggression in its visual appearance. 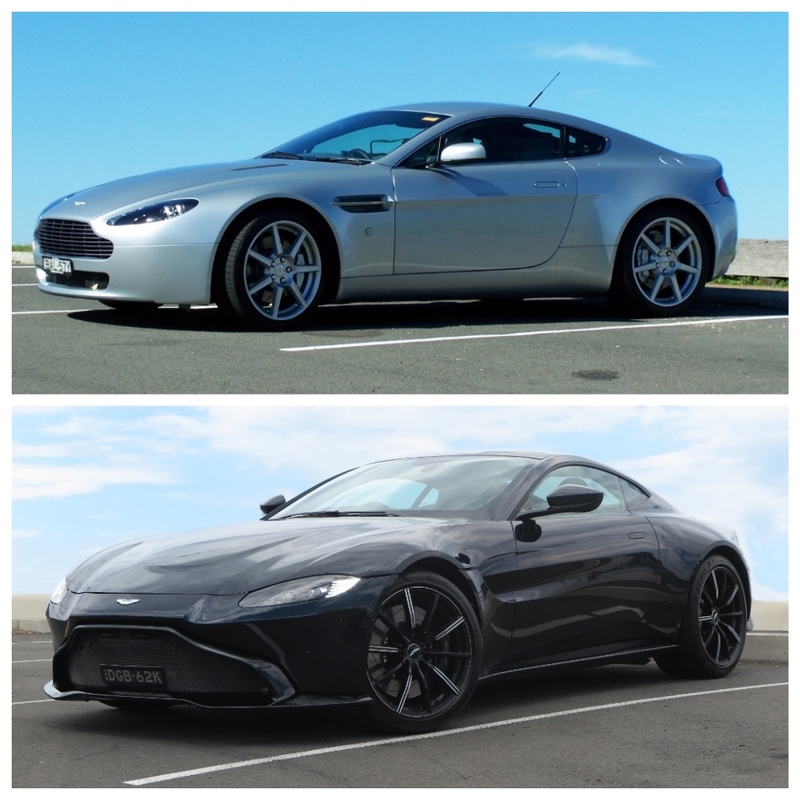 Fast forward to 2019 and the new V8 Vantage is a very different animal. First up the original V8 engine has been replaced by a twin turbo 4.0L V8 provided, in basic form, by AMG. 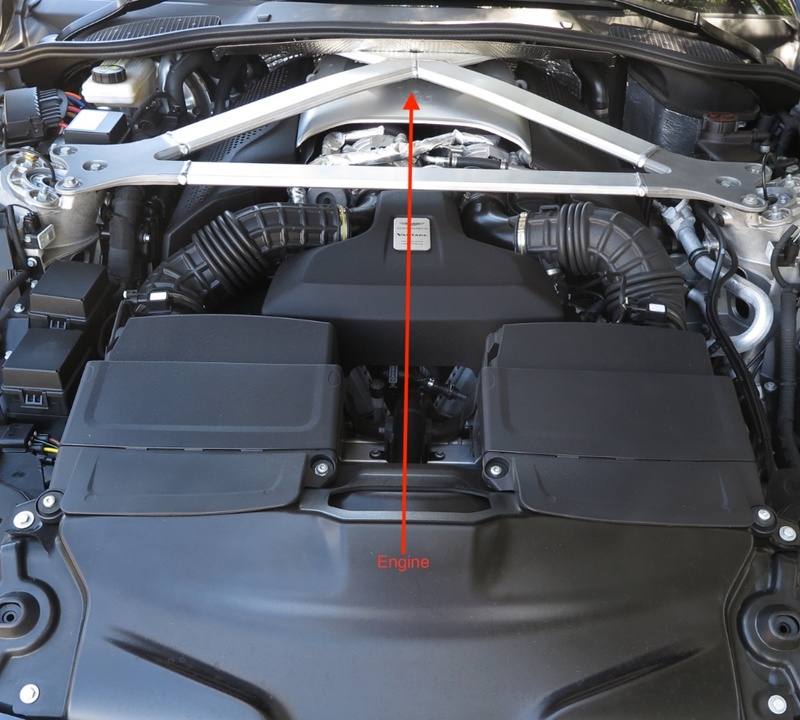 In similar manner to Aston Martin’s development of the AJV8, the new engine is very definitely a product that differs in performance and response from the AMG version. This one ‘barks’ on upshifts and delivers 375kW @ 6000; and 635Nm between 2000 and 5000. Mated to a ZF 8-speed transmission, controlled by paddles, this new Vantage delivers both a high level of sports performance, but is also amazingly docile as a Grand Touring car. The engine is virtually ‘mid-mounted’ as it sits so far back in the engine bay, and I’m told the car has a 49-51 weight split at the kerb, but with a driver on board, the division is an equal 50-50 – and when driven in anger, it feels so beautifully balanced. 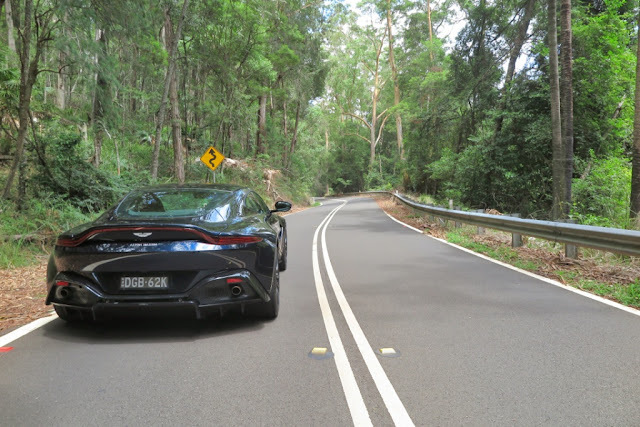 I was able to enjoy almost 700km of driving, on very tight, undulating and twisty back roads, freeways, and some of the best touring roads in the Southern Highlands of NSW. I found the on-the-limit handling to be wonderfully predictable, and controllable – much more so than the Porsche 911 GTS I drove a few months ago. In fast sweeping corners you get the luxury of increasingly mashing your right foot into the carpet, and controlling the reaction of the rear end with both confidence and high levels of feedback. It’s a sensual and satisfying pleasure to drive quickly. Consider planning an end-of-the-week getaway to a country retreat and this car is designed-for-purpose. Not only are the seats incredibly comfortable, but it’s possible to adjust the side bolsters to ensure you are virtually cocooned in your ideal driving position. 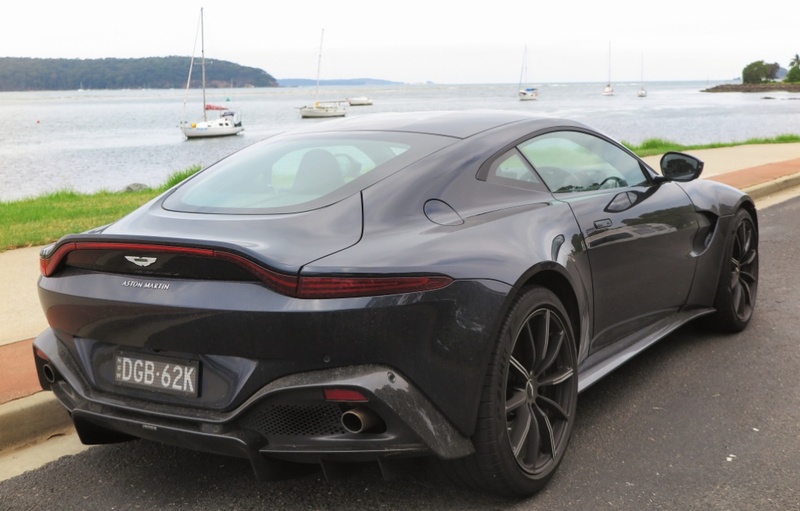 As Jeremy Clarkson recently opined; this car is so good (at the lower end of Aston Martin’s pricing scale) it could deny sales to the DB11 and DBS Superleggera – it’s that good! In addition the trunk is not only a useful size, but a fold down section allows you to fit two full-size golf bags side-by-side with ease. There are three driving modes – Sport, Sport + and Track. Unless you need to exert the full potential of the car, Sport mode is adequate for all driving demands. The real added pleasure of Sport + is the ‘bark’ from the exhaust as you upshift – and it’s loud! 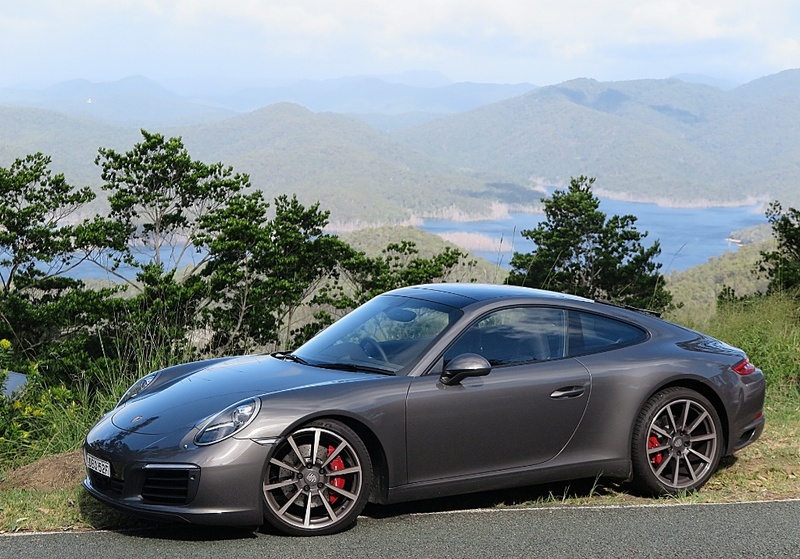 Okay so much for all the gushing superlatives, can it face up to its main competitor, the Porsche 911 GTS, when at AUD$299,950, it’s around AUD$18,000 more expensive than its German rival? For my money the answer is an unequivocal ‘Yes’. 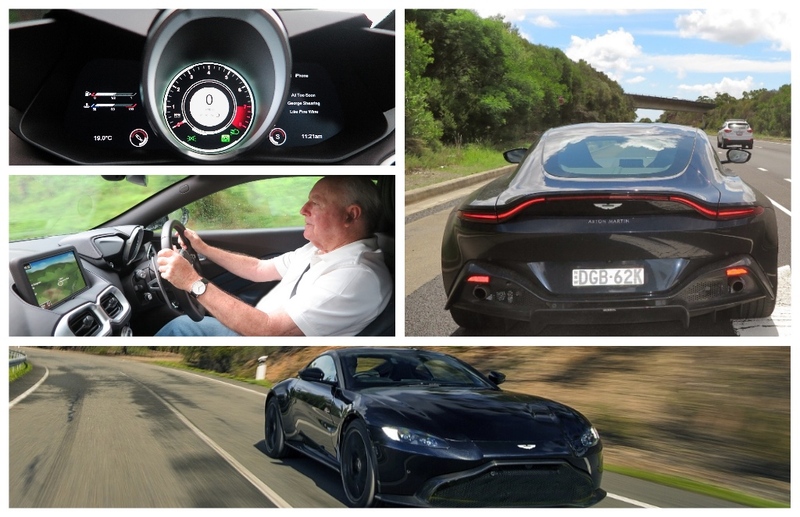 I certainly don’t pretend to be any sort of expert arbiter of judging supercars at this level, but a decently long test drive of the 2019 Aston Martin V8 Vantage tells me this car’s credentials are of the highest integrity and purity. Road signs like this are simply an invitation to have fun at the wheel of one of the world's finest sports coupes. If you claim to be an Aston Martin enthusiast who wants to derive much pleasure from telling your mates that you’re driving a car which can best the Porsche 911 GTS in many areas, then go and put your name down, NOW!